When I started this blog over 2 years ago, it was intended to address the post-treatment limbo we find ourselves in when cancer treatment ends. I found so many blogs and forums dealing with the diagnosis and treatment phase that I wanted to write about the “what next” phase of cancer. However, there are inevitably times when I find myself drawn back into the diagnosis and treatment phase – after all, the shock of the day you hear those words “you have cancer” never leaves you does you? You may also be dealing with the lingering after-effects of surgery or chemotherapy for months or years after treatment ends, and the emotional and psychological fall-out can leave scars that take a life-time of healing. So when a friend emailed me a scanned copy of an article that appeared in last weekend’s Mail on Sunday newspaper, I read the words of the writer with a deep sense of compassion and fellow feeling. It was written by Anne Gildea, a writer with a regular column in the paper, which takes a humorous look at life as a singleton in post-Celtic tiger Ireland. 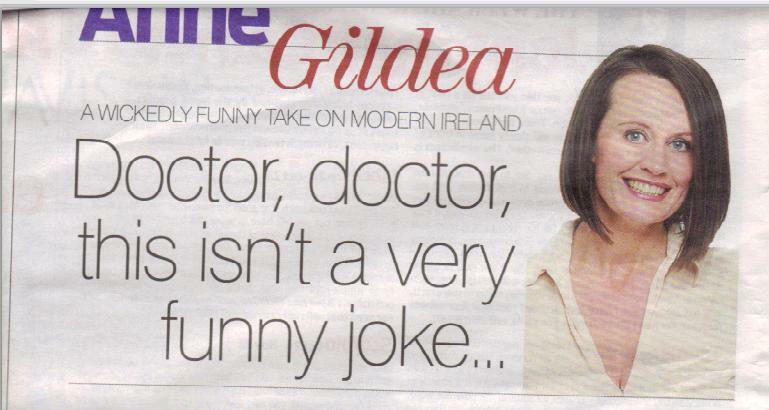 Gildea will also be familiar to Irish audience as a member of The Nualas comedy trio. Reading her account of her breast examination in St James Hospital (after an urgent referral from her GP), her belief that her breast lump was most likely a benign cyst; the “whoosh of emotion” as the consultant tells her it might be more serious; her shock and palpable sense of disbelief as she is whisked off for a mammogram, ultrasound and core biopsies, I felt as if I was right back there myself. All the while she is thinking ” I can’t believe I am in this situation”. As she emerges from her procedures she looks at all the other women sitting in the waiting room of the breast clinic and suddenly she realises “this situation happens to so many of us”. Anne finishes her article by saying that she has to wait 4 days for her biopsy result – 4 days which will decide her fate. Remember that long wait to decide your fate? I sure do. “Fate” Anne says, “can turn on a sixpence” and by now she will know what that fate is. I hope the consultant’s prediction that based on the mammogram, biopsy and clinical examination, they are “99.9% certain it is cancer” proves to be wrong, but if it turns out to be true, I wish Anne the courage, strength and support she will need to navigate her own journey beyond breast cancer, and that she will draw inspiration from the many of us who have come out the other side. Fate, ah yes, the fickle hand of fate.. I read this article on Sunday and was very moved – I hope that she reports back to us next week – I really want to know how it all turns out for her. I too read this article and I was very struck by how she still found black humour in the experience. Thanks for mentioning #BCSM Marie! Anyone can find the conversation by either doing a hashtag search on Twitter or reading through the full transcript http://bit.ly/p1AXqH or better yet, an excerpted version that @chemo_babe put together on Storify that Marie posted above. We can never have enough wisdom on helping each other through cancer. “The Wait” We could all write a book about “the wait.” There ought to be a law that prevents you from having a mammogram, blood test, biopsy, etc. toward the end of the week or before a holiday because the wait turns into a helpless limbo of no one’s at work looking for your answer. I don’t know about you, but I feel an instant bond with the other women in their gowns, waiting to see if the radiologist needs another mammogram. We’re all sitting together, reading a magazine and trying not to be scared out of our minds while we wait. Uf. I hate thinking about the wait. The worst part of it, for me. Worse than any treatment I received. Katie is right – the wait is horrendously stressful indeed. Fate can indeed turn that quickly. And it matters not whether it is in Celtic tiger time or post-Celtic tiger time. Fate doesn’t care. I agree with all who hate the wait. Closure is so much better than sitting in limbo with your mind wandering all over the place, into the depths of hell. Like you, I wish Anne the best, that the medical techs and professionals are all proved wrong. With a pardon to Brenda, the breast cancer sisterhood has just gotten too unwieldy for everyone’s taste. That’s the thing with cancer Jan, it really is no respecter of bad times, boom times, age, gender, race, creed..it is an equal opportunities illness in that way! I, too, remember the other women sitting around me, all of us waiting in our little gowns in that little pink waiting room. I looked around and naively thought they were there getting routine mammograms. It was only after my biopsy, when I returned to the room to gather my things and change, that I noticed the ice packs and the varied expressions of worry. I arrived thinking my biopsy was only happening to me, but left realizing I was just one of many who would be waiting, waiting, waiting to hear if their life was about to change forever. It sure did. Thanks for the post! Renn, what a great comment! It made me think that we joined a club that day we never thought we would be a part of and had no wish to be a part of…but for all that, despite not wishing to be a part of it, I have met so many amazing women and learned so much from being part of this club. What a poignant posting about “The Wait”! I really wish Anne the best as she navigates everything that is dealt to her. I, too, remember waiting — and it is so agonizing as so many people know. Marie, your blog really brought back memories. I think every one of us remembers so vividly when we got diagnosed with breast cancer. It’s funny, I’m a bit unusual about the waiting. I’ve never minded the waiting part and I’ve done a lot of it since my mom’s diagnosis and then mine. I always know bad news will find me fast enough and if it’s good news, well it was worth the wait! And you’re right about that day we first hear those words,”you have cancer,” it’s etched into the memory forever. Hoping for the best for Anne. Hi nancy, thanks for the comment – I love that idea of bad news will find me fast enough..and good news worth waiting for..as somone who is called pathologically impatient by my husband, this is something to remember in future! I am only catching up on this story now, as I don’t get the Mail on Sunday, but I do know of and like Anne Gildea and I am shocked to hear her news. I wish her all the best in her own journey with breast cancer and hope she will take heart from the many of us who have come out the other side. Have been reading her columns in the Mail for as long as she has been writing them, and I always love her irreverant take on things. I am so pleased that she is choosing to continue writing and more so that she is writing about her BC experience – she is helping so many women right now in ireland…i know that for a fact, because I am one of them. I was diagnosed with TMBC a month ago. Reading Anne’s account of her experience in James’ has brought tears to my eyes – her sense of shock at being there at all is palpable, and it is a feeling i remember only too well myself. Anne, i wish you every blessing as you fight this insidious disease. What I love most about Anne’s account of her experience over the past few weeks is that she hasn’t lost her sense of humour..and why would she?! Being diagnosed with cancer doesn’t mean you undergo a personality change overnight. You are still you! People sometimes forget that as they pat you on the arm and murmur sympathic cliches in your ears. Carl, such a good point! A diagnosis of breast cancer is in many ways, an initiation into a class of warrior women. As you fight to regain your health, you will discover new layers to your inner self and new facets of your relationships to others. Breast cancer requires us to both reveal a fighting spirit and surrender to our own vulnerabilities as we seek support from others. No matter what your prognosis, perseverance will make you stronger. Cancer brings an awareness of total uncertainty.The truth is that the only certainty we each have in life is – one breath. I remind myself of this throughout the day, and it stops my busy mind from taking me to places I don’t need to be. I get great comfort from living each breath as fully as possible. Anne – take heart! Mortality rates are decreasing and will continue to decrease. Survival rates are on the rise and will continue to rise. More than 25,000 women are living following a breast cancer diagnosis in Ireland. Cancer is not a death sentence anymore. Like many of us when diagnosed with cancer, i am sure Anne has become a cliche magnet. I wish Anne all the best in her treatment but I won’t be saying “You will be OK. You will get through this” to her, as was said to me, much as I really do hope she will be ok. I do hope people will be there for her though as she embarks on this journey and that they will be of practical and emotional help when she needs it most. I can’t guarantee you WILL be ok Anne, no one can, but I do hope you will make a good recovery and heal from this experience fully. Good luck. Speaking of cliches..don’t pay any mind to the positive thinking brigade (though as regular reader of Anne’s columns I don’t think she will!) if being positive was all it took to have a good medical outcome, we could wish away all our illnesses. Chemo makes you feel sick, fatigued, and a whole host of other nasty things – Negative feelings are entirely appropriate under the circumstances! That’s normal! Many people struggle with what to say to a person who has been newly diagnosed with cancer. The “you’re so brave” and “keep positive” cliches can be particularly irksome, but we must realise that their platitudes come from a place of discomfort on the other person’s part. Marie – your comment about how a new person’s “wait” or diagnosis takes you back, made me think of one of the poems from my Fine Black Lines: Reflections on Facing Cancer, Fear and Loneliness. May I share it with you and your readers? Anybody watch the Anne Gildea RTE documentary tonight?